Deciding on who to instruct to carry out your tree works can be daunting. It is important to select the right company and have the confidence that they are going to work with you and provide a professional, stress free service. 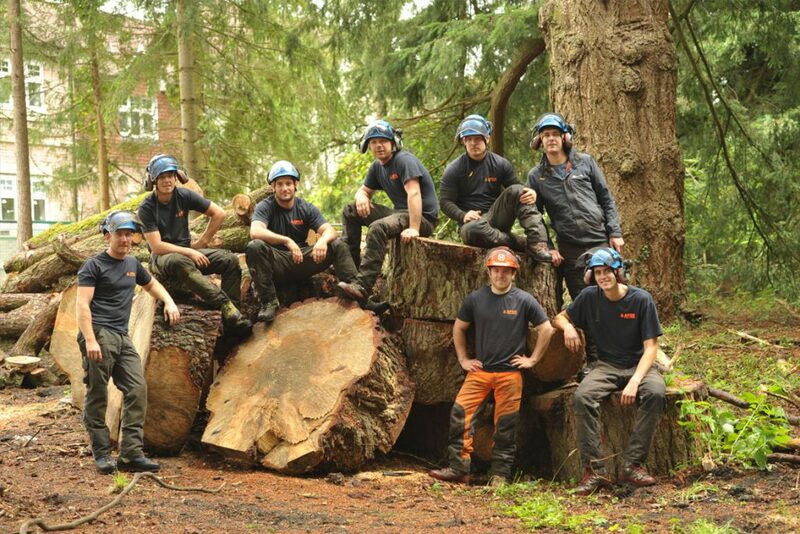 Apex Tree Surgeons Ltd are your local, fully qualified and insured tree surgeons. Working across the South Coast of England they specialise in all aspects of tree surgery, including; tree and hedge trimming and removals, shaping, pruning, deadwooding, stump grinding, and soil improvement. 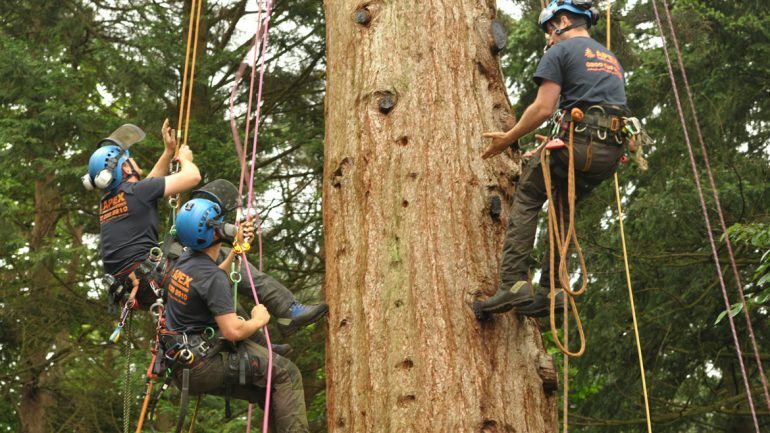 All work is carried out and completed in a professional and competent manner to the highest Arboricultural Association standards. If a tree is overshadowing a garden how can the natural light be increased? Crown raising, tree thinning or reducing the tree’s canopy, are all effective methods to allow more light into the garden. What rights do homeowners have when a neighbours tree overhangs their garden? A homeowner is responsible for maintaining any tree or hedge that falls within their boundary. However, the owners of the tree have a duty of care to ensure the tree is safe. If the tree is protected an application to the Council is required. When is the best time to prune a fruit tree? It varies depending on the type of fruit tree it is. Apple and pear trees are best pruned when they are dormant, anywhere between November to February. Plum trees are best pruned between Spring and Summer. What should be done if a tree is suspected of being diseased or dying? Professional advice will be needed, we can inspect the tree and provide a solution. How should someone go about having a tree removed? If it is felt that tree removal is necessary then the first step is finding out if the tree is protected, which we can help with. Following that we will survey the tree and provide a free quote. If the tree is protected, what can be done? Any tree that is protected requires an application to be submitted to the local council to gain consent to carry out tree works. Would you apply to the council on behalf of the client? If we are employed to carry out the work, as part of our service, we do offer to submit the application on behalf of our client at no extra fee. If a tree is uprooting a drive can anything be done? We carry out all of our quotations for free as part of our service. We will schedule an appointment to visit and advise on the trees in question and send a free of charge, no obligation quotation. 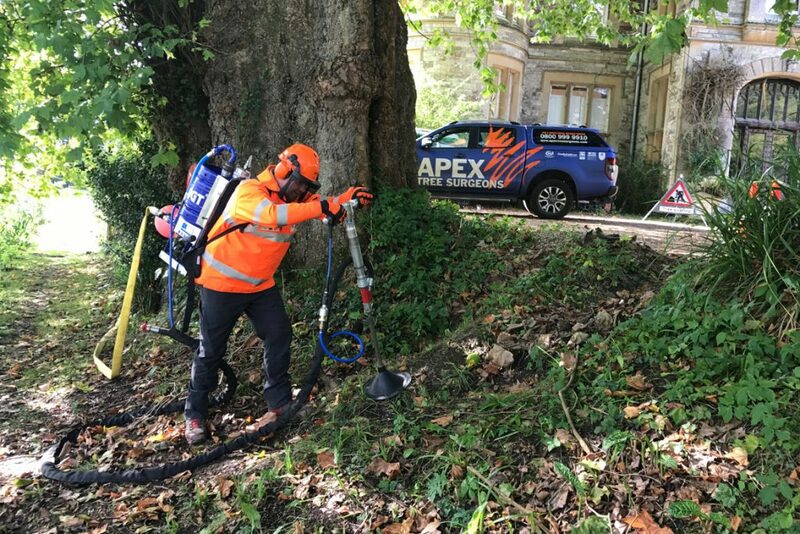 Apex Tree Surgeons Ltd launched their new product, The Apex GeoTech Injector this Summer and it is already a success. The Apex GeoTech Injector is designed to inject high pressure air into soil with low risk and high impact. The GeoTech Injector uses techniques that result in soil improvement, targeting both common and complex soil problems. The tool drills into the root zone where high-pressured air is then released to aerate the soil, naturally decompacting the ground. The cavities are filled with beneficial nutrients to assist tree root health and improve plant performance. Soil decompaction stimulates root growth through the improvement of soil structure allowing a greater amount of air into the soil and reactivating the natural biological process. your garden. For a free quote and advice on how this revolutionary equipment can improve your garden, call them on 01202 856404. When should someone start protecting their trees? The first sign of frost is the signal to start protecting your plants. How can trees and hedges be protected through the Autumn and Winter? Covering the roots and soil in mulch or chippings is an effective way of protecting the roots of the trees. How can trees be protected from pests and diseases? Injection of enriched BioChar into the root system improves soil health and changes soil dynamics to become resistant to pests and diseases. Is there a way of ensuring trees are safe this winter? It is advisable that trees are inspected on a yearly basis to ensure there are no defects that may cause harm or damage to persons or property. We are offering a free visual tree inspection to new and existing clients this winter! If someone is worried their tree may cause damage in high winds do you have an emergency line? For all emergencies please call 07973 479215. We will provide an instant quote and carry out the works imminently.